In just five days you will know more than 95% of website owners and marketers— the basics of profitable, persuasive internet writing. 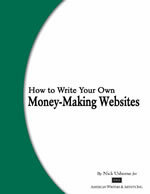 You will learn from simple, yet powerful, exercises to show you how to formulate a money making website. You will be shown examples using a very successful website that expertly uses all the profitable techniques that you will learn in the internet writing class. 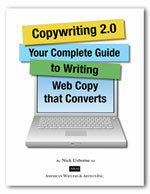 There is not better way to learn than by looking at a website that is successful because of its persuasive copywriting. â€¦ with the very simple and basic concept of the Most Wanted Response and Back-Up Responses. This persuasive internet writing secret is so simple it usually overlooked on even the biggest of websites. This technique will show you how to get the order!